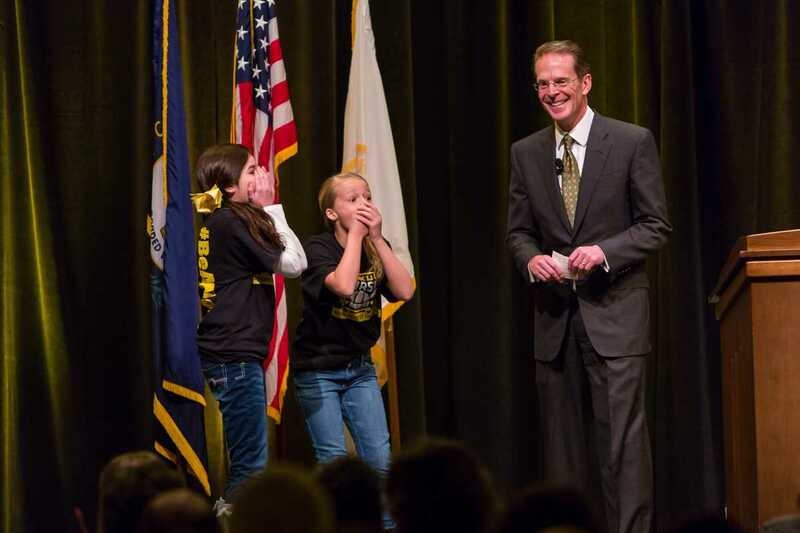 NKU President Mearns awarding two middle school girls a trip around campus and Cincinnati during during his 2015 Spring Convocation. President Mearns spoke about the past year and the upcoming year in the Student Union Ballroom on Friday, Jan. 9, 2015. HIGHLAND HEIGHTS, Ky. — President Geoffrey Mearns will leave Northern Kentucky University after four years, the university announced Tuesday, and the campus community was shocked by news of his departure. Mearns was hired at Ball State University to serve as their 17th president, an announcement made at the Muncie, Indiana campus at 1:30 p.m. Tuesday. Mearns notified the Board of Regents that he will not renew his contract, which expires July 31, according to a release. Education and Human Services, said she didn’t know Mearns was leaving until she saw him standing behind a Ball State podium on a live video stream. Burris, who has worked at the university since 1979, said she was “disappointed” that the NKU community wasn’t notified sooner. “I felt that he didn’t have enough respect for us to tell us he was leaving before making the statement at Ball State,” Burris said. Burris wasn’t alone. Kerry Stephens, a freshman electronic media and broadcasting major, said she was also surprised by the news of Mearns’ departure. Clare Mearns, President Mearns’ daughter, said in a statement she supports her father’s decision. “I fully support my father’s decision and hope the NKU community will be able to understand and support him as well. I am so proud of everything my dad has accomplished at NKU and I know that the best days are ahead for our university,” Clare Mearns said. Senior Lauren McClanahan said President Mearns will be missed. The communication studies major said she’ll miss seeing Mearns at university events. She also said Mearns has left a lasting impact on NKU and what campus is today. Disappointed to learn Geoffrey Mearns is leaving NKU but happy for the progress made during his tenure. Best of luck at BSU Prez Mearns. @PresidentMearns We are grateful 4 your leadership & innovation in fueling NKU’s continued rise. The university & region are better for it. “In terms of literal growth, our new rec center is absolutely outstanding. We are literally growing, with the Health Innovation Center, the move to Division I athletics … It’s hard to say that he didn’t have a huge impact on NKU,” McClanahan said. Michael Baranowski, president of the faculty senate, said in an email statement that he always expected Mearns wouldn’t be at NKU forever. Perhaps no one will miss Mearns more than Will Weber. The senior Student Government Association President has worked closely with Mearns throughout his college career, even serving alongside Mearns on the Board of Regents. Weber said some of his favorite memories include working with Mearns on campus plans and initiatives, and he’s confident Mearns has paved the way for the next president.